Timber Creek is having STAAR/EOC exams on May 8 and 9, 2018. Find all the information you need to know about the testing, including test rooms, relocation rooms, schedule and more. Wednesday, May 9 are the Biology and US History EOC exams. There will be late arrival this day. Please see the schedule for that day below. On May 9th seniors are required to attend class for their entire school schedule that day and will need to arrange their plans accordingly because the times of classes will be different. AP testing is going on as well, it starts Monday, May 7 — Click here to see more about AP testing. Wednesday, May 9, 2018 will be a late arrival day for 10th grade and 12th grade students who are not taking the STAAR EOC Biology or US History Test. Late arrival for these students will be at 11:00am. If a student is unable to find transportation for late arrival, they may still ride the bus in the morning like normal or arrive at the regularly scheduled time. These students will report to the Small Gym. Off campus classes will be cancelled. 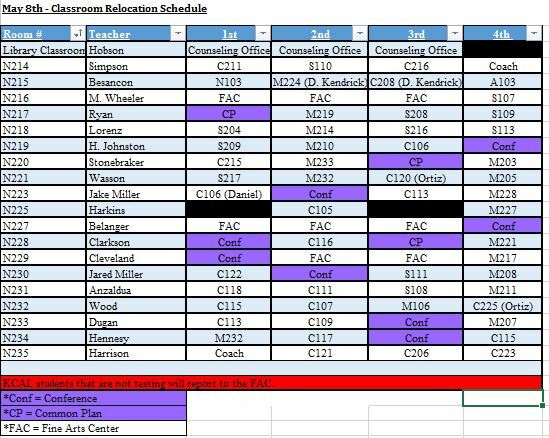 These students will report to the Fine Arts Center (FAC) during these class periods. All 10th grade students that are not testing will report to the Fine Arts Center (FAC) at 11 a.m. for attendance. All 12th grade students that are not testing will report to the Small Gym at 11 a.m. for attendance. Seniors will be required to attend class for their entire school schedule on this day. Please arrange your schedule accordingly as the times of classes are different. The Algebra/Biology/US History STAAR EOC exams have a time limit of 4 hours. Because of this, students will take a break for lunch during the test and eat in the test centers. All students taking a test will need to bring a sack lunch to school, as well as #2 pencils. Students will be able to purchase a sack lunch from the cafeteria. No outside deliveries will be accepted. As always, students who are testing should be well rested, arrive on time, and be mentally prepared for testing. Testing room assignments will be posted at the North and South ends of our campus, as well as a QR code for students to scan and view their room assignment electronically. We will also have adults readily available on the morning of the test to assist students in finding their testing center. Locations for all three tests (Algebra I, Biology and US History) are contained inside the following document. The document is ordered by last name, first name and grade level. Students can use CTRL+F on desktop or other search functions to find their name more easily. All testing students are to bring their own lunch. Sack lunches will be available for purchase for any student that is unable to bring their own lunch from home. On state-mandated testing date(s), student use of cell phones, smart watches, and all other electronic devices is prohibited. Please be aware that students are not allowed to send or receive cell phone calls, text messages, or use any kind of electronic device during the administration of a state test. Invalidation of test scores may subsequently result from student usage of electronic devices.